This Way Up : They Call It Nutbush! One of the most striking hits of 1973 was Tina Turner’s `Nutbush City Limits` with its fuzzy guitars, strutting beat, high pitched synth solo and vividly sketched portrayal of a “one horse town in Tennessee”. It was significant for the singer on three counts as it was the first self written song she recorded, being inspired by her upbringing and also the last single released credited to Ike and Tina Turner before the couple’s divorce. It has been described as her declaration of musical independence. The song has been covered by a number of artists and Tina Turner herself has re-recorded it. There is even a dance named after it that originated in Australia. 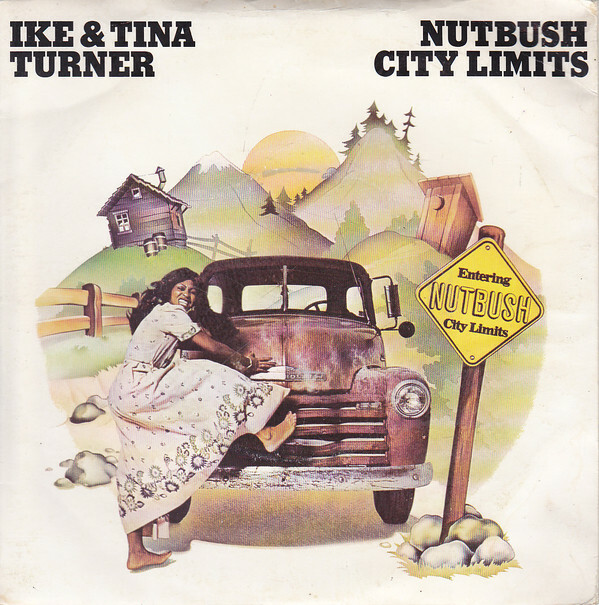 The real Nutbush doesn’t actually have city limits as it’s not a city but `They call if Nutbush unincorporated rural community” just doesn’t sound anywhere near as catchy! For years there was a rumour that Marc Bolan played the distinctive guitar though it was actually a member of the Turner’s touring back James Lewis. Bolan did however play on a couple of other tracks with them. The song’s genesis has been attributed to Tina’s then difficult domestic situation with Ike leading her to reflect back to earlier times though the lyric doesn’t really paint a flattering picture of the place. With a 23mph speed limit, no motorcycles and everyone going to church on a Sunday Nutbush is conjured up as a strict, God fearing community (the line “you go to church on Sunday” is repeated) with strict rules. Whether or not Tina intended it though there’s definitely a contradiction in the place’s attitude to alcohol. We’re told that there’s no whiskey for sale but that there is a gin house. This suggests gin versus whiskey rivalries! If you do get drink there’s no bail and while incarcerated the song’s most memorable line suggests a diet of “salt pork and molasses” is all you’ll be allowed. This doesn’t sound like a very edifying diet. Salt pork is salted belly and is like bacon only fattier. Normally it is used as a flavouring for stews. Molasses is comprised of the leftovers from when cane is boiled to make sugar though it does contain some sugar content. Apparently it does contain important vitamins and minerals such as calcium, magnesium, iron and selenium. You can make dark rum with it but I’m not sure that would be quite suitable for people jailed for being drunk! The real Nutbush is in Hayward County, Tennessee and is an unincorporated community which means it doesn’t have its own governance and is administered by a wider authority. So the folks of Nutbuish didn’t necessarily set all those rules,. Perhaps they sneak something more edible into those jails? The place owes its origins to the slave trade being established in the early nineteenth century by settlers who brought African American slaves to work on nearby cotton plantations. There is still a cotton producing plant in the area, Nutbush’s population has never been more than about 400 and Tina Turner’s birth there in 1939 seems as if it’s the only notable event in its history; she lived there until she was 16.. In 2002 a section of a road nearby was named Tina Turner highway. An example of the place’s relative isolation is that it lost its post office as early as 1905. Incidentally there is another place called Nutbush in Memphis. Tina Turner has never lived there.